It's four minutes before I am scheduled to teach at Wanderlust O'ahu. Baron Baptiste and Shiva Rea, the giants of yoga are also presenting at the same time as me in neighboring studios. It's only been two years since I have been teaching in the U.S. so I am a relatively unknown teacher here. Jon Stewart once commented that his Canadian friends always ask him, "What do Americans think of Canadians?" The answer is, "we don't!" The popularity I have experienced in Canada hasn't translated here. I can see the collective thought bubble above the heads of the hundreds of students: "who is this guy?" It's like giving a concert at a local coffee house just around the corner from two stadiums where both Sting and Madonna are playing the same night. You may think yogis are as non-judgmental as some of the spiritual texts would have you believe. The reality is this is a crowded profession. 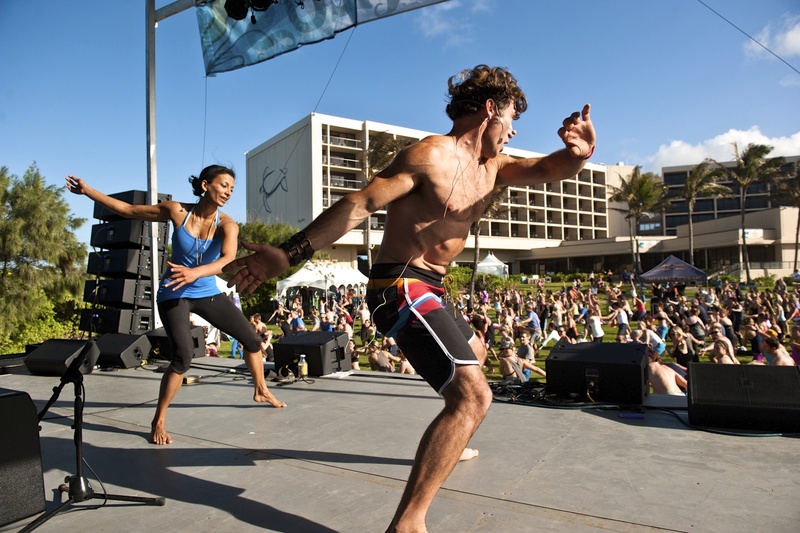 At yoga festivals like this, people give you just one chance. As a presenter if you give a mediocre class or have an off day, the word of mouth that this guy's class was "just ok" will filter through the festival and attendance will be low. You may not even get invited back next year. On top of this, there is a famous rockstar in my class. The pressure to perform increases. In case you think that life isn't full of challenges and a yoga teacher's day is all about meditation and chai tea drinking, these last four minutes before class are completely vata-inducing. Vata is the yogic term for when our mind becomes unfocused and erratic like the wind. Ironically, this is exactly what we are experiencing today as the massive Hawaiian trade-winds are blowing the yoga mats of the hundreds of students in the class everywhere. Another problem to solve: shall I ask students to get rid of their mats or not? Someone asks me "Is this class ok for someone with a bad knee?" I answer and smile and be as present as I possibly can as my multiprocessing brain can be. I fiddle with the iPod jack, which isn't working right and I run through a last-minute lesson plan to keep this workshop focused. I glance at my watch -- it is 8:58 a.m. and the class starts at 9 a.m. I close my eyes like I do before every class I teach and remember that what I am teaching in this class ultimately is about what I need to be doing right now. I exhale stress and worry out, and breathe in the warm air. I feel the quietness inside, the still place away from the turbulence of my thoughts. I feel places in my body where the breath isn't going, for me it's the lower back ribs. Like a parent calms an upset child with their touch, I make sure the breath goes there and I generate that kindness to my own self with the breath I am breathing. I have gone from scrambled to clear in less than 30 seconds. One minute until the class starts and my eyes are still closed. With this deeply present body and mind, I remember my personal definition of yoga: "Yoga is the art of getting out of your own way." I know that the only thing that really matters to any person is to be, give and receive love. I don't try to force it out, I just relax and let the feeling come. I don't need to give a class as good as Shiva Rea or Barron Baptiste. They are excellent teachers and I know they will give great classes. Benjamin Franklin said it best: "Comparison is the thief of happiness." The instant I compare myself to them, it's over. I have no more super powers. Comparison is my kryptonite. I know a joy inside that is beyond comparison. It is there in all of us, we just need to trust it. I breathe in my Mantra: "Nothing to prove, everything to share." Instantly an energy fills me from the inside and puts lightness in my heart. I just want to share this feeling and that's what I do. There is no pressure. I heard a comedian say recently that when they perform stand up, they are as relaxed as most people are in a Jacuzzi. My breath is that Jacuzzi jet on my lower back ribs -- I am just here -- sharing what I love. After the class people compliment me but I know I can't let my ego get inflated. In the manner of the Bhagavad Gita, I offered what was in my heart and let go of the fruits of my actions. The more I get out of my own way, the more powerful it becomes.